The sound affect – thus Evelyn Glennie, as solo percussionist a world star of the classical music, describes a hearing. After she lost her hearing to a large extent in her childhood, she learned to hear differently using the body as a resonance area,to feel the sound. Director Thomas Riedelsheimer and Evelyn Glennie goes on an expedition in the inside of these sound worlds, which everything demands our senses. Starting with an old factory building in Dormagen, where Evelyn with Fred Frith make their first CD with improvised music, the film undertakes a journey around the world, to Japan, California, New York and Scotland. Together with Evelyn Glennie and her musical partners we dip into a fascinating universe, in which we begin to hear pictures and see sounds. The starting point of the sound journey are the noises, sounds and rhythms, which surround us in the daily life, the clicking of the luggage wheels on a glass airport deck, the wirring and humming of the infinite rows of air conditioning systems in the house ravines of New York, the echo of the nebula horns in north California, the voice tangle in a Japanese department store. From there the way leads more deeply, to the emergence and the origins of the sound, to the investigation of the rhythm than basis of each way of life; from the breath to the heart impact, from the silence to the music, from hearing to seeing and for feeling, from the oscillation to the firm subject. The sounds, rhythms and acoustic memories weave themselves with Evely Glennie's musical meetings. A jam session with the legendary Drummer Horacio Hernandez on the roof of a skyscraper in New York, the wild drums of the Japanese Taiko group of Ondekoza, a duet with the step dancer Roxanne Butterfly, fascinating interaction with Fred Frith. At the heart of every life form there is rhythm, Movement, flow, change, renewal and repetition are all based on rhythm. It is only in rhythm, that we can experience time. Without vibration, without oscillation, there is statis. There is nothing. Stability and solidity are illusions. Everything oscillates and vibrates - from the bridge of steel and concrete, to the energy shells around an atom. Even colours oscillate at different frequencies. We recognize and experience our world through rhythm. Everything vibrates - everything speaks. It is, in essence, a universe of sound. 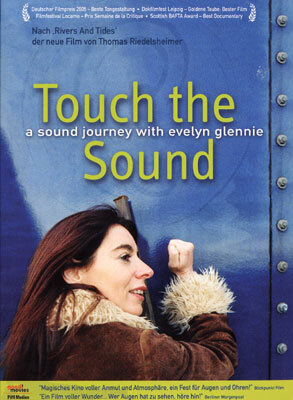 A classic documentary featuring the legendary percussionist Evelyn Glennie and friends. We dip into a fascinating universe, in which we begin to hear pictures and see sounds. Film in English with German liner notes.